One obvious thing is to look for Hajar-e-Aswad itself. Hajar-e-Aswad is in fact a small fragment of black stone fixed in a silver frame. Some people get confuse and consider silver frame as Hajar-e-Aswad whereas the Black Stone is very small compared to silver frame and is fixed in its center. A security guard is always standing 24/7 at Rukun Al Aswad of Kaaba. 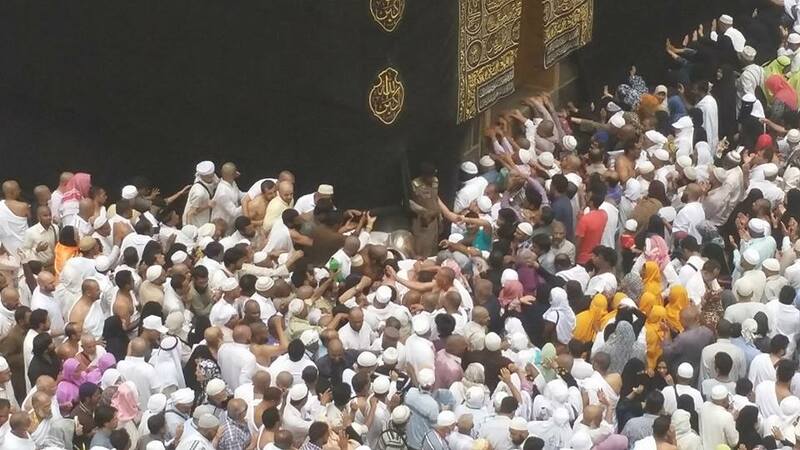 The silver frame of hajar-e-asad can be seen in below pic at bottom of Kaaba corner, beside security guard. While pilgrims are trying to reach and kiss the black stone. However it may be difficult to see Hajar e Aswad or Security Guard from a distance, specially if you are on ground floor in Mataf. In that case, look for corner of Kaaba having four golden circled texts. The corner of Kaaba cover having four golden circled texts aligned vertically (can be seen in below photo) is Rukun Al Aswad of Kaaba. The cover of Kaaba is made of black cloth with golden text embroidery on it. Most of this text is horizontal and on door of Kaaba. 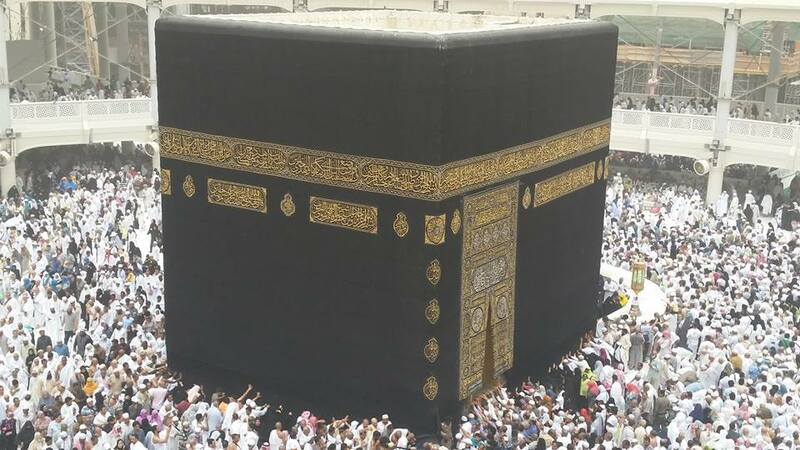 However only one corner of Kaaba has four golden circled texts Allah-ho-Akbar meaning Allah is Great. This is Rukan Al Aswad – starting and finishing point for Tawaf. All other three corners of Kaaba are black. 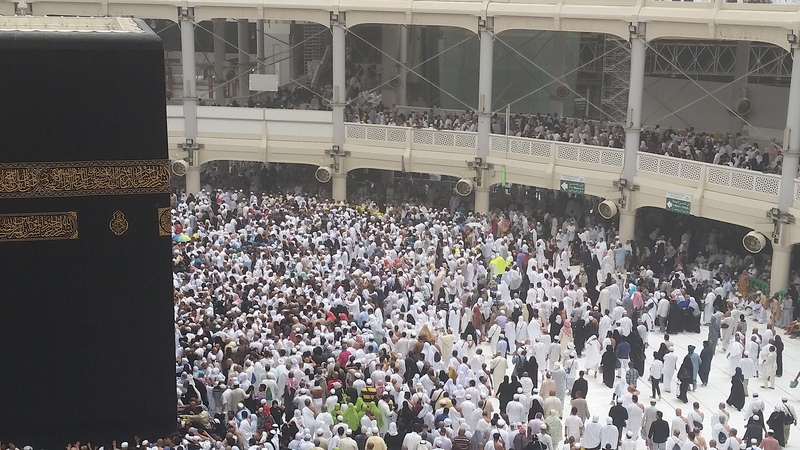 Look for Green Light opposite to Rukun Al Aswad – Kaaba corner. Few years back, there was a black marble line on floor of Mataf indicating starting/finishing point of Tawaf. However it was creating problem for pilgrims as people used to slow down & start looking downwards while approaching this line. Hence ceasing the flow of people walking in circle. In order to cope this issue, administration removed that black marble line and placed a green light at some height exactly opposite to Rukun Al Aswad of Kaaba. Can you spot a small green vertical light near bottom of middle concrete column in below pic? That’s the one; indicating starting and finishing point for Tawaf. Be noted that since expansion work is going in Masjid al Haram the size or shape of this green light may vary with time but most probably, a green light will always be there. Usually there is always a queue of men along wall of kaaba. Though that’s take some time but you may reach hijar e aswad in an hour. On the other hand a separate queue is formed for women after fajr and asar prayer for hajr e aswad. This is specially true during ramadan and hajj days. Another thing is to go on a time when kaaba is least crowded which is early morning, say 2 to 3 hrs agter fajr prayer. Great. May Allah accept it. I’ll inshaallah start to read your blog, especially about Pakistan as it’s still blurred to me. May Allah SWT bless you wherever you are now!